Six Steps to Beat Cancer and Feel Awesome!! Cancer is not a dead end. It may be tough, but you can still come out of it with flying colors. You not only have to fight a physical and mental war but an emotional war as well. If you have a strong willpower you can overcome absolutely everything. All you need to do is be positive and fight it. In simple terms, let the doctors do their job and you do yours with a positive mindset. Another important factor is the people around you; the patients don’t need sympathy but just motivation and positive environment around them. Sometimes, a few encouraging words are enough for the person to boost up. I have personally felt that, with positive thoughts and mindset you can directly win more than half the battle. As we all know the word itself is so scary and it is true that you don’t fight cancer alone but your entire family fights along with you. 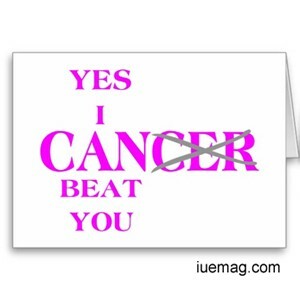 Today, I'll share some thoughts which are really simple and can help you not only fight but survive cancer as well. 1. Believe in the Almighty – God has managed to put you in this situation. So, he will definitely guide you to come out of it as well. 2. Hope for the best but be prepared for the worst. 3. Have a strong willpower and a positive mindset; it will help you think on how you can improve the worst which you have already accepted. 4. Thank your family who have supported you throughout. 5. Thank your friends and well wishers who have prayed for you and are still praying. 6. Don’t think much about the future; just live each day until bedtime. Sidharth Ghosh is a contributing writer at Inspiration Unlimited eMagazine.